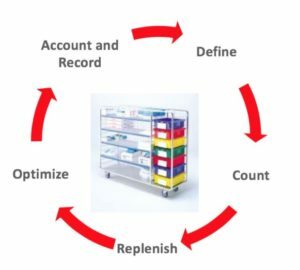 Finally, Oracle Cloud is ready for warehouse replenishment in store rooms at hospitals and other locations. Periodic Automatic Replenishment (PAR) solution is available as a standard solution from release 19A. Previously, Oracle Fusion only supported MinMax planning replenishment functionality. Customers could also use RF SMART applications to maintain their PAR parameters as part of an integrated mobile solution with Oracle Inventory Cloud. How to use Oracle Cloud PAR? PAR can be used for quantity tracked and non-quantity tracked store rooms. Supply technicians visually review stock quantities. They will scan the items that need to be replenished with a handheld device, containing an external mobile software solution, like RF SMART. Oracle provides a Replenishment Web Service to import the scanned restock quantities into Oracle Cloud. The system will automatically create purchase orders when sourced at the supplier or transfer orders when restocked from the local warehouse. We have ample experienced Supply Chain Management consultants who can help you implement this standard solution into your warehouse replenishment process.